After recently performed at Neon Lights, Canadian electronic group Crystal Castles is ready to return to Singapore for another rowdy wild show, and not only that, the duo will also make their debut in Thailand for their tour in Asia. Known for their chaotic live shows and lo-fi melancholic homemade productions, the band will also stop in Seoul and Taiwan in support of their comeback album, “Amnesty (I)”, the band’s first album since the departure of previous frontwoman Alice Glass in 2014. 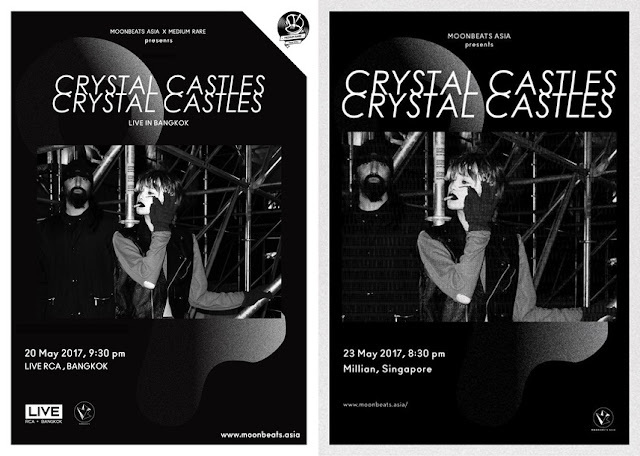 Now consisting of members Ethan Kath and new vocalist Edith Frances, the latest and fourth album was released nearly four years after band's previous album, marking the longest period between consecutive studio albums by the band. The Bangkok show is happening on Saturday, 20 May 2017 at Live RCA with tickets pricing at THB1190 at ticketmelon.com. Meanwhile, the Singaporean leg tickets cost SGD70 (Early Bird),SGD80 (Standard), and SGD90 (Doors), which can be purchased via ticketbox.sg.